Choosing the best web host for your new website can seem like a challenging task. With all of the different options out there catering to different needs and skill levels, it’s easy to get lost. 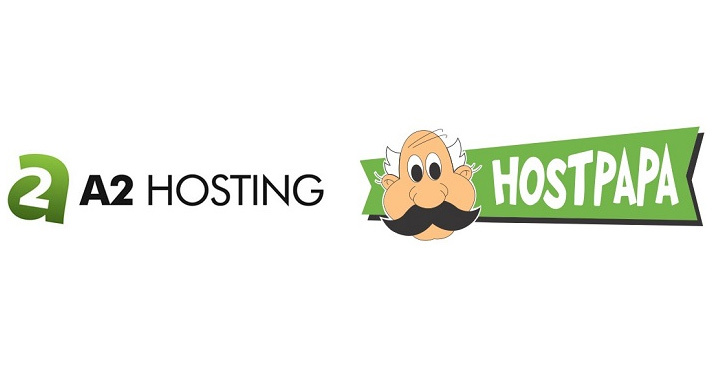 This review will look at two popular web hosting providers that you may be considering, A2Hosting vs HostPapa, and will compare them to each other and the competition so you can better make a decision if one of these hosting providers is right for you or your business. Starting off with A2Hosting, they provide excellent uptime of 99.96% on average, with an average downtime of less than a second. Their response time of about 0.5 sec on average is also really encouraging. They boast speeds about 20x faster than competitors, and while that number might be a bit inflated, it’s true that they are much faster than most competitors. Average page load times last year were around 200 ms, and this year they’ve gone up a little to around 500 ms, but they are still among the fastest. HostPapa has an amazing 99.95% uptime, but when they go down they go down a little longer (over a second on average). Their load times definitely suffer at about 850 ms on average, with some months going over 1000 ms. This isn’t terrible, but it’s worse than A2Hosting. HostPapa has some misleading pricing that can cause some confusion. They also boast higher renewal costs, with the advertised prices being good only for the first term. Then they jack them up. A2Hosting has straightforward pricing, but on average they tend to be a little more expensive than some. A2Hosting makes it easy to secure your site. They provide HackScan, which is a free service with a firewall, 24/7 security monitoring, and brute force protection. A2Hosting also, of course, has WordPress which comes with its own suite of add-ons. They even have an easy wizard to help you get an SSL certificate. HostPapa also has great security. They’ve got antispam and a firewall enabled by default along with 24/7 monitoring and intrusion protection. Their business plans have free SSL certificates, dedicated IP addresses, and automated backups. It’s nice to see two companies that care about the security of their users. A2Hosting makes your life easy. They have great tools and an excellent knowledge base on site to help you search for and figure out any problems you may be having. They also offer free site migrations from another provider, which is something not commonly offered freely. A2Hosting also provides simple one-click setup of popular content management systems, like WordPress or Joomla. HostPapa also has a great support center on their website that helps walk you through any issues you might have without the need to contact support in some cases. There is also easy setup of content management systems. If you want to go your own way, you can use their drag-and-drop builder to build your website in a simple graphical interface. They also offer migration assistance, but it’s not free of charge sadly. A2Hosting’s support is well-loved by its customers in most cases. They have a fast response time, and they try hard to resolve tickets as quickly as possible. They are also supposedly very friendly, which is a bonus. Their support team is available by phone, live chat, or email around the clock every single day, including holidays. HostPapa has unfortunately poor customer support reviews. While they make contact easy with a great many avenues of contact and 24/7 support, it seems they are not the fastest and sometimes have huge delays in resolving tickets. Given the confusing pricing and extra fees, they probably have a lot of complaints as well, so that might be part of it. But overall being misleading is poor customer service. In this section, we’ll summarize everything covered in this comparison into pros and cons lists for easy reference. Their speed is one of the best. A2Hosting has unlimited storage and bandwidth options. They have good security features. Their speed is a bit below average. HostPapa’s support can be a bit slow. Their pricing is a bit misleading. Overall, based on the features offered and the better speeds and customer support, A2Hosting is the clear winner. Their speeds are faster than most of the competition, and they have excellent customer support. They also boast a lot of free security features and free website migrations for new customers. HostPapa just falls short with slower speeds and poor support, which considering everything else is mostly equal makes them miss the mark. The lower price may be attractive to some, though. And in case you aren’t convinced that A2Hosting should be the winner, here is how A2Hosting compares to GoDaddy.